Green buildings basically mean the environmental friendly buildings, which are constructed in the healthiest way they can be to avoid hazardous impacts on the environment. The resources like land, water, energy etc. are judicially used and the environment goals are set prior from the starting of the construction of such buildings. In other words, they are ‘no harm’ buildings to the environment. Proper use of energy and environmental components: Firstly, the environmental components like air, water and natural resources are used in the most efficient way. Mainly renewable energy is used in such constructions. Energy sources, which can result to be harmful for the environment are avoided. Heat recovery ventilators and geothermal heat pumps are used to save energy. Maintenance of the indoor of the buildings: Green buildings assure to be naturally ventilated and ventilating system is such that it does not harm the other neighboring buildings. Smoking areas are tried and constructed outside the building or are build in such a way that the smoke does not affect the environment of any other parts of the building. The use of the daylight is maximized. Biodegradable and natural friendly cleaning machineries are used. Eco-Friendly materials used for construction: The engineers of these buildings try to ensure that the materials and resources used are environmental-friendly. From building materials to the interior furniture, everything is mostly made through recycling of products. ‘Waste reduction plans’ are carried out by the engineers and team. Basically, from this, we can make out that from the construction to the setting up of the interior of the buildings, everything is done in a manner through which the harm on environment can be minimized. 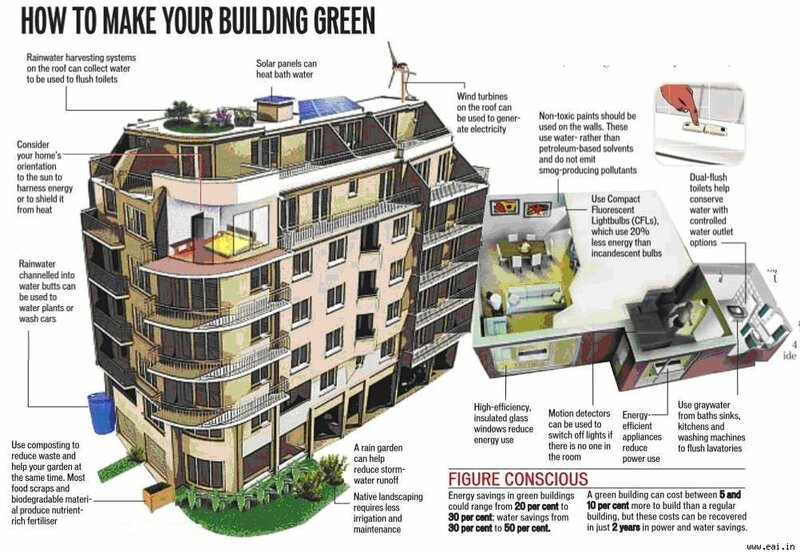 “With the increasing problems of pollution and dirty environment, the Green Building concept is actually helping in a major way to control major pollutants to enter into the environment. Go Green!” says Sanya, a South Campus student. The concept of Green Buildings are rapidly increasing. India is also progressing towards building green and owns more than 300 functional eco-friendly, green buildings. Mumbai accounts about 20% of the total green buildings in India. ONGC has also started up with their green building initiatives. Their first ‘Green’ office in the country was successfully inaugurated at Dehradun (Uttarakhand), this May and they are now coming up with four more green buildings at Delhi, Mumbai, Kolkata and Hyderabad. Around 40% of energy of the world is consumed by buildings and more than 20% green house gas emissions come from the buildings. Green Building is a very positive concept of controlling these figures and is a way, which provides us with solutions to live healthier and make the world a better place to live in.